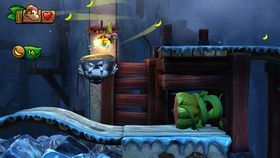 Frosty Fruits is the name of the twenty-eighth regular level in Donkey Kong Country: Tropical Freeze, as well as the sixth stage in the game's fifth world, Juicy Jungle. This is the first level in the game that has an arctic-esque atmosphere. Most of the level also takes place inside a lofty timbered factory where huge popsicles are being produced. Said popsicles act as platforms. Dangerous rotating drills that come out from and retract inside solid ice blocks make up for the dedicated obstacles here, but Snowmad soldiers also try to hinder the Kongs. In the game's Time Attack mode, this level's time limit for earning the Gold Medal is 01.30.00. The music is named the same as the level. The piece uses several ambient sounds that enhance the level's frozen atmosphere, and features a segment from a past Donkey Kong Country musical piece; that is, "In a Snow-bound Land" from Donkey Kong Country 2: Diddy's Kong Quest. Long-time Donkey Kong composer David Wise is credited for both musical pieces. Moving on, there are two brick platforms at the bottom of the screen. They are covered with snow, and the pit in-between them is hatched with destructible ice blocks. Another abyss opens up, this time rooming a fruit spring platform with a Hootz above it. Afterwards, a frozen bricked bridge that starts with an Item Handle (covering a banana bunch) continues with a long slope trailed by bananas; above its base, a conveyor rope powered by two woody pulleys lead a hanging ice block, topped with a wooden platform and hosting two drills. An abyss with two fruit spring platforms, a popsicle stack machine and a frozen ground patch (obfuscated by another conveyor rope with a drill-containing ice block, as well as an Archy and a chilled fruit spring platform), stands before a very solid wall of brick. 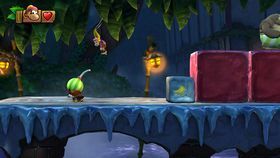 Over this wall, right after its ledge, are two feeble ice blocks that cover a tunnel, into which the Kongs can fall to get impelled by a vertical fruit spring platform. The tunnel is guarded by a large group of consequent drills arranged in the ceiling, as well as a trail of bananas. The tunnel's way out has a Painguin Tucks sentry; after this, a territory ledged by two decorative bamboo lanterns contains the first checkpoint of the level, as well as an ice block containing an Item Handle, which, upon being pulled out, frees a Flying Banana and its "school" of bananas. 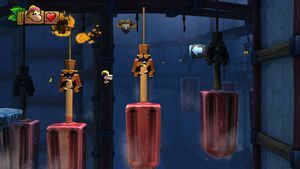 The territory ends with an impassable chasm; however, there is a Barrel Cannon that launches anyone who gets inside towards the background of the level, on a huge, upside-down popsicle hanging by a wooden mechanincal arm. Upon landing on its surface, it starts sliding down its stick, but a row of other huge popsicles, arranged the same way, hazardously avail at that moment. These lead to an enormous and continuous icy bridge, overshadowed by two walls with drills underneath. In the area divided by the two, there is a circular array of reeling bananas and a Papa Painguin (the bananas can be collected to receive a Banana Coin). The bridge ends with a pit, from which a fruit spring platform had grown. Atop this platform is a vine switch which activates a mechanical arm holding a huge popsicle of the same kind as before - the player can choose to either follow the next platform and dodge some spiky drills from above, or use the popsicle to slide down along with it and access a secret area under the aforementioned platform. Both ways lead to an area with huge popsicles getting carried along conveyor belts and two Hot Hootzes guarding the place. Furthermore, there is a pair of Barrel Cannons that lead the characters to the frontground of the level; specifically, where a checkpoint prevails. Dixie Kong, having passed through a tunnel with drills and having been bounced off fruit springs, jumps on a Tuffton. Beyond the checkpoint, the heroes venture more inside the factory. A popsicle stacking machine and a Puffton help the characters reach a Barrel Cannon. It launches them over a spike basin and onto a series of horizontal fruit springs that bounce the heroes off. In between the two areas with springs (quite designed to be symmetrical), there is a tunnel of drill ceiling and slippery floor. After this army of obstacles, a slippery, curved girder leads towards a series of popsicle stacking machines that form ground for the characters in order to advance further. (On a side note, the player can see ice blocks getting carried by wooden slides in the background, all arranged in a convoluted labyrinth throughout the icy factory.) Beyond the machines is a patch of ground that starts with an Item Handle and continues with a slippery tunnel of huge drills. In the front of its exit is a high, arched bridge which can be accessed with spring platforms. A group of Tucks led by a Pointy Tucks walk on the bridge; behind them, the bridge abruptly ceases into a group of uniformly-placed spring platforms. At the right is a rather solid and enormous frozen and meandering plant stem, which marks the Kongs' exit from the factory's plant and re-enter in the jungle. The stem acts just like actual ground. On the stem, there is a Plump Fruit (hiding a banana bunch) and a Papa Painguin. Down the descending stem, there is yet another slippery tunnel with drills tucked in the ceiling. A large chasm opens up afterwards, but a Barrel Cannon helps the Kongs overcome it and reach a large patch of ground, whereon a Walbrick marches. Before the Walbrick, encrusted in the ground, is an ice block covering a spring platform, above which is a set of reeling bananas. Right after this area, the very last group of popsicle stacking machines hide in the jungle's canopy. The popsicle blocks they drop form a stairway to the level's Slot Machine Barrel. Beating this level unlocks the boss stage of Juicy Jungle. K: This letter can be found above the first conveyor rope in the level. For further reference, this rope is horizontal and carries a large ice block containing drills that come in and out towards the Kongs. O: The letter O can be found almost immediately after the first checkpoint of the level, next to the second large popsicle that plunges from above. N: After a series of springs that propel the characters, the letter N can be found above a Tuffton located between several popsicle block dropping machines. G: The letter G is located in a discreet alcove on the ceiling of a drill tunnel, at some distance before the end of the level. The area beneath the large bridge, where the fourth Puzzle Piece can be found. After the players have passed a slide above which stand ice blocks with drills, and after they overcome a popsicle block dropping machine, they encounter two platform topped with snow and a row of bananas, divided in two by a pair of breakable ice blocks as well. These ice blocks cover a small pit which warps the player's character into a bonus area, where several groups of bananas and banana bunches have to be collected in their entirety in order to receive the first Puzzle Piece. Right next to the first checkpoint of the level is an Item Handle, frozen inside an ice block. The ice block can be destroyed with a ground pound. After getting pulled off the ground, the handle liberates a Flying Banana, which is followed by a trail of regular bananas. Each of them has to be collected in order to transform the Flying Banana into a Puzzle Piece. Beyond an area with drill ceilings and a Papa Painguin, there is a pit with a bouncy fruit platform. Above this platform is a vine switch; it triggers a big hanging popsicle after getting pulled. The popsicle serves as a platform and helps the player reach an obscure place under the regular road, in which a Puzzle Piece floats right above another bouncy platform. After the letter N, there is a tunnel whose ceiling is coated with spacy drills. After the Kongs exit this tunnel, they reach what appears to be the end of their road, marked by a a semi-arched bridge stretched high up in the air. However, there is a hole in the bridge's support wall, which leads into an area beneath the bridge, hedged by its other support wall. A Puzzle Piece can be seen next to this wall, and it can be accessed with a moving Barrel Cannon that only shoot upwards. If the players perform a Roll Attack under the Slot Machine Barrel (the device which ends the level), they might discover a secret zone with two patches of ground and a ditch between them. The Kongs can fall inside this ditch to collect a Puzzle Piece, but it is highly recommended that the player minds the lateral harmful drills. In the background, very close to the area where the first Puzzle Piece can be acquired, players can notice a three-dimensional render of one of Bowser's tanks from Super Mario Bros. 3, behind a broad glass pane. It seems to be conserved in a frosty fruit storage. * Exclusive to the Nintendo Switch version.